“What is the situation in South L.A.?” is the question Colin Bogart, Education Director at the L.A. County Bicycle Coalition, posed to launch our discussion of the removal of a 7.2 mile bike lane planned for Central Avenue from the Mobility Plan 2035. Both Malcolm Harris, Director of Programs and Organizing from TRUST South L.A., and I had to laugh. The question was posed half-jokingly, of course. As both Harris and I argue, too often mobility advocates coming into the community are unfamiliar with the history of the area, the racial, cultural, and socio-economic dynamics that define the community, or the variety of barriers that can constrain mobility there. And the local advocates and actors who do have that knowledge are generally not brought in until way too late in the process – long after planning, design, branding, and engagement around plans are already well underway – limiting their contributions to a rubber-stamp approval. As a result, mainstream mobility advocates are often unable to speak to members of the community in terms that resonate with those stakeholders’ realities. Worse still, the language used to promote active transportation can be deeply alienating. Narratives about the benefits of bicycling, the extent to which “bikes mean business,” and exhortations for people to see their “streets as sites of recreation” border on insulting in neighborhoods where the presence of bikes signals a lack of resources and a history of insecurity in the public space forced people to look to private spaces to build community. Still, it would be naive to assume that everyone in the community is going to react in the same way to active transportation infrastructure. Or that skepticism about the city’s intentions means conversations on the topic of active transportation are futile. Instead, we reiterate, it is key to listen and to understand where people are coming from and then to speak directly to those concerns. To help listeners get a better sense of just where community stakeholders might be coming from, Harris opens our conversation with an excellent synopsis of how imposed segregation, trauma, suppressive policing, disinvestment, and disenfranchisement fueled demographic changes in South Central, and how those dynamics shape relations and needs within the community today. We then spend the rest of the hour drawing connections between that history and the outcomes we see today. We also tie that history to concerns we raise about policing and the role of law enforcement in implementing Vision Zero, gentrification and displacement, and the continued lack of a mobility framework that is able to adequately accommodate the extent to which the cultural and socio-economic landscapes of our communities intersect with the physical one. Many thanks to Colin Bogart and Nick Richert for giving us the space to have such a wide-ranging conversation. We hope that you find the discussion enlightening. You can find the conversation here, and other archived sessions of Bike Talk, here. Great picture of a typical error in American street design. If the edges of the crosswalk meet in the street, the curb needs to be extended. I am guessing you didn’t listen to the conversation or read what I wrote very closely, because that wasn’t what was said. Not reading/listening has never deterred you from sharing your opinions, but it would be nice if, for once, you gave someone else that basic respect. You want to be a councilperson for a diverse community. Some of the folks you would be representing come from the kinds of experiences Malcolm and I speak about. I learned a lot from this! Thanks Sahra for your insight and for authentically sharing thoughts and experiences of the community. You are guessing and you are, in this case, wrong. What is exceptional in what is being asked for by the residents/political class/businesses in this area? That is not exceptional – that is what nearly everyone wants. The problem is that the scale of these bike and pedestrian projects is quite small, relatively easily reversible, and the positive impacts are can be quite large for a plurality of the people walking, taking transit, and riding bikes. So, the balance of “more outreach” vs. “let’s just make something happen and deal with the complaints” is once again what is stopping safer streets. When it is “more outreach” and the neighborhood groups and NGO’s have been out on the streets, holding rallies and protests, appearing at every public meeting, documenting the needs and the fixes – that “more outreach” certainly seems like a strong vote for “do nothing, we like it like this”. So while I have listened to the podcast and read what you’ve written, my lived experience tells me that I need to analyze what you’ve said as it applies to actually doing something in a city to make the streets safer. Again, even when you read/listen, you tend to hear what you want to hear. My personal experience engaging with you suggests that happens because of a combination of hard (and consistently deeply mistaken) assumptions about where I am coming from and an unwavering belief that your own ideas are always vastly superior, regardless of the scenario and arguments you are presented with. It’s a dynamic that makes dialogue with you rather unpleasant and unproductive. Which I genuinely find unfortunate, given that we share goals of a safer and more accessible city for all. So I will return to the basics and say only that, in contrast to your assertion, a Central Ave bicycle lane and road diet would actually be a project of a rather large scale – significantly impacting life for all who move, live, and work along that 7.2 mile corridor and repeat that the message here is not necessarily, “more outreach” as much as it is “stop doing such a terrible job with outreach and ignoring the realities, needs, and aspirations of the community the first time around.” As both Malcolm and I suggest, there was much more room to move on pushing that project forward, but the very lack of the thing you seem to disdain so much – “know[ing] our local politics” – helped doom the project from the start. Disdain for more outreach and knowing local politics? The conclusion of the content above is: do more outreach. I boiled it down. I summarized it. I did not write it off. But go one step further, because “outreach” gets expensive past a certain point; and the status quo kills. Malcolm and I spent an hour talking about the importance of engagement meeting folks where they are and why and how that matters. I spoke specifically to the concerns raised by the businesses and more appropriate ways to have engaged with them. If your comprehension is impaired in some way it is because you have made this blanket association between NGOs and opposition and “hostage rackets” or whatever it is that you call it. Which, incidentally, Malcolm and I also address, referring to the way consultants and mainstream advocates are tasked with working in lower-income communities of color and the problematic language and frameworks they work within, only bringing on people who actually know the community when it is too late to do any sort of engagement of value. But none of this should be news. I touch on these issues in just about every article I write and in every single interaction I have had with you. At some point the burden falls upon you to figure out how to hear it. You don’t have to agree with it but asking me to walk you through the same conversation over and over is unproductive and, frankly, disrespectful. And I find it bizarre, in that, as I have said to you before, I actually do not disagree with you with regard to some of your concerns about nonprofits and their roles or the way they are deployed. But again, the burden is on you to figure out how to hear those things. Because spelling it out for you clearly is an exercise in futility. The My Figueroa Project is the only instance that I’m aware of where a LA city councilmember’s mind was changed on installing bike lanes through the use of outreach. In that instance it was either install the cycle tracks on Figueroa St, as was originally planned, or else risk losing all $20 million for the project by not fulfilling the agreement. That councilmember was Curren Price. Its a completely different situation for getting bike lanes on Central Ave. Since you repeatedly use insulting derogatory remarks toward what white bicycle advocates know and do in south LA I feel compelled to mention that I completed 24 bicycle/ped counts last fall that was arranged by the LACBC. The only area I didn’t cover was the westside. At least 6 of my count locations were in south LA, including Watts and Central Ave at 54th St. Offhand I can think of two locations in the east side of the San Fernando Valley where my counts mainly were of low income people of color. I didn’t do those bike/ped counts to favor any particular area. I was more interested in getting as much of the locations completed so that the total count would be more representative of the amount of bicycling throughout LA. Each time I signed up I waited until the last moment to try and make sure everyone else had picked a location that they were willing to do. I used a combination of my bicycle and Metro transit rail to get to all of these locations. At just over 100, my Central Ave at 54th St. bike counts were the second highest amount of the street locations that I did. Just above USC on 30th St at Hoover I counted 135 bikes. I quite sure that the counts done on Hoover St just north of USC will have by far the highest bicycle counts of any street location. Its likely to be in the hundreds. That said, Its likely that the counts I did on Central Ave had the highest amount of people riding on a sidewalk. Well over 90% of bicyclists were riding on the sidewalk at that location. Depending on the situation I’ll ride my bicycle on sidewalks, in the middle of motor vehicle lanes, take routes that mainly go through residential streets, ride in bike lanes where available, have ridden on all of the bike paths in the SFV and use a combination of bike/train or bike/bus. I can relate to why people chose to ride on the sidewalks, its much less stressful for them than riding in the street. In the last handful of years I have tried to look at riding a bicycle from the standpoint of what would be a comfortable route for most adults to ride on. From those observations, watching videos and blogs about cycling in the Netherlands and Denmark, reading extensively about bicycle infrastructure, along with conversations with lots of people on bikes, I’ve come to the conclusion that its not very likely that most of the people who only ride on sidewalks and paths would ever be interested in riding on the street with only a stripe to separate them from moving motor vehicles. From their point of view that would exceed their level of tolerance for traffic stress. If just standard bike lanes are installed on Central Ave I would bet that most of those who ride on the sidewalk would look at it with puzzlement of who that is for. The most politically difficult places to install bikeways can be on arterial streets if it involves removing space from motor vehicles. Both the 2010 bike plan and 2035 mobility plan lay out a network of bike lanes on some of the most heavily traveled streets in LA. The downside to that is there is a very high failure rate in attempting to get approval for bike lanes on most of those arterial streets regardless of how much outreach is done. The upside is that the opposition feels there is a lot of pressure to install bike lanes on a street and will frequently agree to an alternative street. If you look at it from the standpoint of trying to get separate space for bicycling on arterial streets, then any of the 3,000 miles of arterial streets that get bike lanes should be considered a step forward. Its a slow process in the U.S. to install bikeways mainly due to the very low rate of bicycling. Think of it as a series of evolutionary steps much like changing a wolf into a cocker spaniel. Its easy to look at a plan or see how advanced and extensive the Dutch bicycle infrastructure is and think that we can simply do that. Unfortunately with so few people bicycling in the U.S. it creates a situation of very little money, staff and space that can be devoted to installing bikeways. One thing that has to be understood is that there is very little chance that the curbs on arterial streets will be moved more towards the center of the street. LA doesn’t have enough money to maintain the streets or sidewalks that they now have, let alone create wider concrete sidewalks. One of the requirements to either install bike lanes or widen the sidewalks on Central Ave would be to remove motor vehicle space. Its difficult for businesses along a major street to see how removing through motor lanes to install bike lanes will benefit them since there are so few people riding bicycles. But if you show them how it would enhance the area in front of their business by widening the sidewalk, they could see how that might make it better for their business. Both installing bike lanes and widening the sidewalk involve using only temporary materials by the city of LA. Starting with removing space from motor vehicles to install a temporary extension of the sidewalk can be a evolutionary step towards getting bike lanes. The most difficult step is getting the councilmember and businesses to agree to removing space from motor vehicles. Once everyone gets used to having less space for motor vehicles, then the striping could be modified to have protected bike lanes installed between the parked vehicles and curb. To do that on Central Ave would probably require the removal of the center turn lane at mid-block that was installed after the road diet to get the needed extra space for bicycling where passenger side parked vehicle doors would open. Not only does there seem to be agreement to remove through motor vehicle lanes on Central Ave to create space for active transportation, but as a bonus councilmember Price is asking for bike lanes on Avalon and San Pedro. I look at that as positive steps towards not only greater safety for all users of those roads in south LA, but also increasing the possibility of more bikeways there than if there was only an agreement to put bike lanes on Central Ave. I do not use derogatory remarks to describe white advocates. I have long-standing and pretty well-documented issues with the standard frameworks and language advocates tend to use to engage and “improve” lower-income communities of color, which often tend to be quite condescending, ignorant of community dynamics and realities, or altogether inappropriate. The condescension is unintentional and well-meant, but it is condescension – even bordering on white saviorhood – all the same. It is 2016 – we, as an advocacy community, need to do better than that. I’m not the first to make that point with regard to equity and inclusiveness by a long shot. Nor will I be the last, unfortunately. What you don’t seem to grasp is that its unlikely that unprotected bike lanes on Central Ave would make a significant improvement to the transportation problems on that street. Removing two through lanes to either install bike lanes or a widening of the sidewalk using temporary materials would make a safety improvement for all users of that street by slowing down the motor vehicles by removing one motor vehicle lane in each direction. Its difficult for most people throughout LA to believe that a change like this would have some benefit for them. If this does go through and its been in place for a while, then the next step could be to remove the middle turn lane to create a protected bike lane next to the curb. If its designed right, bicycle riders on the sidewalk would probably prefer to ride on the cycle track, but if its a unprotected bike lane next to moving vehicles most bicyclists will likely stick to riding on the sidewalk. I seriously doubt that unprotected bike lanes would be something that business owners or even sidewalk bicycle riders on Central Ave would indicate that they want, no matter how much outreach is done to try and convince them of the advantages. When people see a bike lane placed between moving vehicles and parked vehicles its hard to imagine who that benefits other than a few people on bicycles. Moving the bike lanes either next to the curb on the street or sidewalk creates stronger arguments for installing bike lanes as it creates benefits for a wider range of people. Here’s an example of the outcome of having outreach meetings. 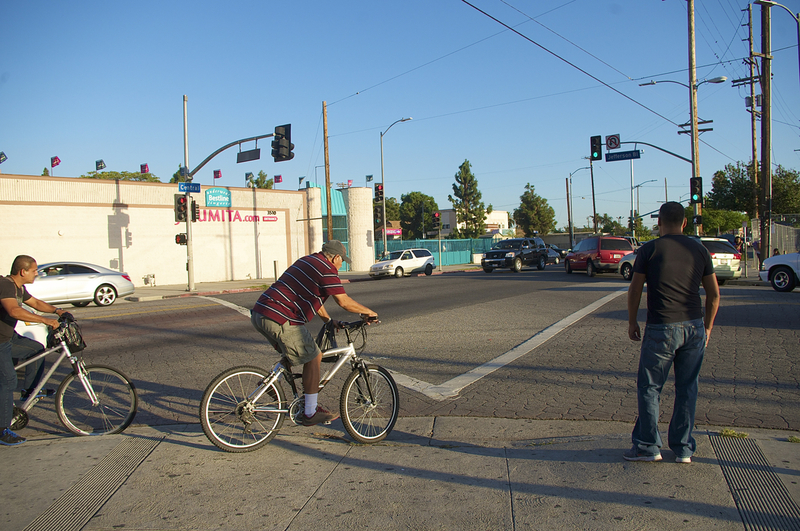 I went to at least six meetings about installing bike lanes on Lankershim Blvd. Three of those were at two neighborhood councils and another three were designed to be small round table groups arranged by councilmember Paul Krekorian. I didn’t see that these meetings had changed anyone’s mind. There was also door-to-door outreach with business owners within the area of Lankershim Blvd where the bike lanes would be installed. Several of them supported the idea. All of this wasn’t enough to get councilmembers Tom LaBonge and Paul Krekorian to agree to installing bike lanes on Lankershim Blvd. What happened was that the two neighborhood councils stated that they wanted bike lanes on Vineland Ave instead of Lankershim Blvd. There was also a Toyota dealership on Lankershim Blvd that wanted the bike lanes installed on Vineland Ave. The end result was that this business and the neighborhood councils asked for bike lanes on Vineland Ave. Without the pressure to install bike lanes on Lankershim Blvd there wouldn’t be bike lanes on Vineland Ave. I look at that as a win for increasing the amount of bicycling even though Lankershim Blvd has much more major destination points for cyclists compared to Vineland Ave.
One of the questions that the new director of the LADOT, Seleta Reynolds, was asked at a welcoming party that I attended in LA was how to get more political will for bicycling infrastructure. Her answer was don’t mention bicycles. The obvious reason for that answer is the majority of people don’t use bicycles and so taking away road space from motor vehicles for that small group of users would seem to make the situation worse to either a business owner or a motorist. Most of the motor vehicle space removed on streets, at this point, will depend upon councilmember approval. Seleta Reynolds has stated she wants to work with councilmembers who are willing to take risks in the hope that installations of bicycle infrastructure in those council districts will inspire other council members to want the same in their district. With limited resources in terms of both staff and money the current goal of the LADOT is to do 10 miles of bikeways per year. The emphasis now under Seleta Reynold’s leadership is on higher quality rather than quantity. She has stated that protected bike lanes are worth 50 times more to her than unprotected bike lanes. The latest protected bike lanes are on a half of a mile stretch of Los Angeles St in downtown LA. That cost $750,000 to install. Considering that the entire amount for bicycling in last year’s fiscal budget for the city of LA was $6.4 million, that installation on Los Angeles St took up a lot of those resources. It was the first time that the LADOT had installed bicycle specific traffic signals and the first time that they had installed a bike lane between a bus stop island and the original street curb. Its a slow process to increase the miles of bikeways. There are still about 300 miles of bike lanes yet to be installed out of the original 719 miles on the 2010 bike plan. At an installation rate of 10 miles of bikeways per year it would take at least 30 years to finish the bike lane miles on that bike plan. Central was, at one point, intended to have a protected bike lane, but Price decided he wasn’t having any of it. Which is a terrible mistake, because people simply will not ride a full mile out of their way to get from Central to Avalon and back just to go north or south. I remember that whole push back against the bike lane on Lankershim. And yes, the Toyota dealership was a huge opponent to having the bike lane on Lankershim. The stupid part is the bike lane they put on Vineland has no turning lane for the street that goes down to the Red Line Station. So if you’re on Vineland, you have to try to cross and ride with the traffic across 3 lanes to get to the left turn lane. It’s very dangerous. Or you can cross that street and wait 15 minutes for the light to cycle so you can cross the street and double back to go west to the station. Would have been nice to have a lane on Lankershim to lead seamlessly to the station. It’s like one step forward, 2 steps back. It must be amazing to go through life assuming everyone who disagrees with you or critiques you must be trolling you. Since you spell “haters” with a “z”, I now know just how cool you are! Keep pretending you care about certain communities that deep down inside you avoid like the plague. Of course unless you deliberately spend some time in South Central – just to be able to sanctimoniously tell people you just spent time in South Central. You guessed it – I’m so cool! I’m way too cool for school! But you’re just being nasty now, for reasons that I’m going to guess have very little to do with me. I’m sorry you’ve been so afflicted and I wish you well with whatever that it is that troubles you. I am just calling out people who pay lip service to ‘da hood and pretend you are down with the ppl in da hood just to impress their liberal friends. Don’t use the ppl of South Central that way. First of all, nobody is ever impressed with me, no matter what I do, so there’s that … But considering you don’t know me or just how much time I spend in South Central, which happens to be a lot – both for work and just stopping by to see folks I know and love – I can only conclude, again, that this complaint has very little to do with me. If you want to be nasty, you are most welcome – I would not wish to suspend any pleasure of yours. But I do find it puzzling and rather unfortunate. Especially given all the ugliness out there on the interwebs these days…it seems that sort of fishing would be much more productive elsewhere. So, I will have to leave off our correspondence here. Keep using the ppl of South Central as your trophy cause du jour! Such a phony!